I won’t spend too much time on the old songs here. Opening number Itchin’ On A Photograph is wonderful, and I can’t help but recall clapping along frantically to its beginning during Grouplove’s Splendour set and accompanying sideshow whenever I listen to it. Second single Tongue Tied is pretty cool and very upbeat, EP track Colours is as awesome as ever, and I’ve never really cared for Naked Kids that much but I suppose it has its place here and I’m definitely in the minority when it comes to this track anyway. Right, so onto the more exciting new stuff. Spun is definitely one of my favourite songs on the record, as I knew it would be from the moment that I heard it live. It gives guitarist Andrew a chance to flex his lead singer muscles at the same time as playing the frantic ukulele part that drives the song relentlessly forwards. It is a hectic, chaotic, hyper-active song, and it is oh so much fun. Chloe meanwhile sees bassist Sean taking his turn at lead vocals, and it’s a bit more of a bluesy number compared to the rest of the album. 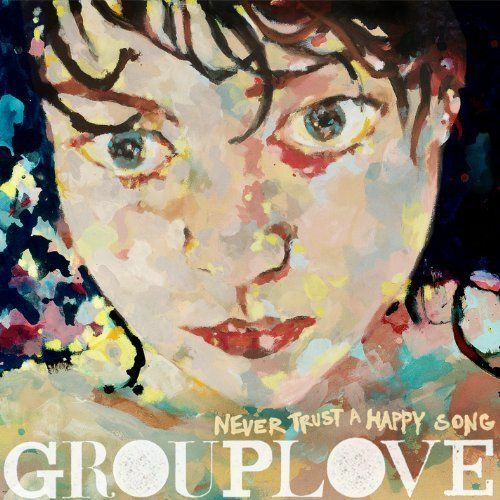 Grouplove pull of the song flawlessly though, and they do likewise with Cruel And Beautiful World, a folk ballad almost reminiscent of some more restrained Mumford moments. Meanwhile Christian’s vocals are superb throughout, particularly on Colours and Lovely Cup, a punchy pop number where the interplay between his voice and Hannah’s is captivating. So yes, while there’s plenty of upbeat indie pop/rock/whatever songs here, there’s also heaps of variety. Grouplove may be a new band and they may be kind of attempting to find a unique voice, but in the meantime it seems that they can make pretty much whatever style of music they choose to play sound good, due in no small part to the natural chemistry within the band. It’s so nice to see a band living up to the potential of their early demos with a debut album this strong. Sure Grouplove speak in cliches some of the time, but ultimately these cliches are delivered so genuinely and with such flair that they come over as sincere and are surprisingly powerful. This is particularly true of Love Will Save Your Soul, a more anthemic number built around a pretty generic chorus lyrically that is rescued by Hannah’s superb vocals and the same feeling of carefree joy that seeps into all aspects of Grouplove’s music. It’s actually one of my favourite songs on the record, and it can’t help but bring a smile to your face, just like the record as a whole. Grouplove have crafted an irresistible debut album. In fact, the only thing the band got wrong is the title. Their album may be full of happy songs, but it simply impossible not to trust them with all your heart. I was really looking forward to this release, particularly after seeing one of the band’s recent sideshows. You’ve mentioned all the songs I remember from their set and I’ll be picking this up as soon as it’s released. Tomorrow I think? Once again, tops review dude. Thanks man, appreciate it. Definitely a great listen.